Glenda and her husband, Russ, are longtime clients from Houston, Texas, who vacation in Heber Springs, AR, each fall and go fly fishing with us. Russ is retired from NASA so it is always a wonderful history lesson of the space program when you get to spend a day with him on the river. He is really a golf fanatic but he still enjoys a day of fly fishing with his wife. 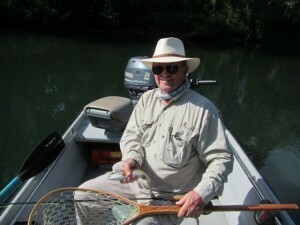 We had a beautiful fall day on the river with gin clear water that required long leaders, light tippet, and small flys. Glenda and Russ had to work at it but they definitely brought lots of nice Rainbows to the net. The most productive fly of the day was a #20 copper Zebra Midge. Several other patterns worked well including various #16 Sowbugs, #14 Goins Gold Softhackle, #14RG/PT Cruiser and even a couple of fish on #18 Adams dry fly. Overall it was just a delightful day on the river with two of the nicest people you will ever meet. It is always a pleasure to spend a day in the boat with them. 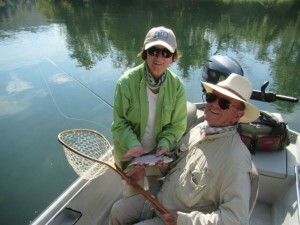 We will look forward to fly fishing with Glenda and Russ next fall.